August 30, 2013  Got food on the brain this Labor Day weekend? Us too. 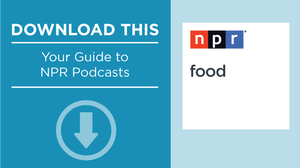 Thankfully, NPR streams an all-food, all-the-time podcast, covering topics from the farm to your table and beyond. Dig in! July 9, 2013  When it comes to books, we know not to judge one by its cover, because it's the stories that matter. In this latest chapter of the NPR Podcast Guide, we introduce a playlist for stories worth telling beyond the page: NPR Books. 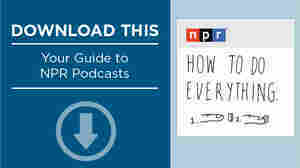 June 19, 2013  In this edition of the NPR Podcast Guide, we're on a mission to help you learn something. Well, not just something, but how to do everything. Here's the download on How To Do Everything, a podcast from the producers of Wait Wait... Don't Tell Me!. 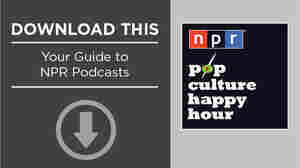 May 31, 2013  At This is NPR, we take seriously the charge to help you discover your next favorite thing from NPR. This summer, we're navigating the world of NPR Podcasts. With 111 podcasts produced by NPR, this will be a big task. But anything for you, dear reader, so let us be your guide.